Tonight we celebrated the release of my new poetry collection, Middle of the Night Poems from Daughter to Mother :: Mother to Son from en theos press–and we chose champagne, of course! 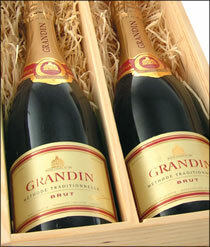 Actually, Grandin, to be precise, is a French sparkler NOT from Champagne but from the Loire Valley. I picked up at a tasting at a local restaurant featuring wines from the Henry Group and others. I paid around $20 for it and found it a refreshing change from the typical supermarket sparklers which most of us more commonly enjoy. It offers fine bubbles and lots of complexity–not sweet or fruity, but nutty (almond and hazelnut) with lots of acid (lime? lemon? ), spice, and yeast. We had the Grandin with a dinner of fresh shrimp right off the boat, simply prepared in butter and garlic, with pasta, and I have to admit that it was gone before I realized I lacked sufficient wine notes to say much about it except that, given the opportunity, I would absolutely buy it again. Read more about Middle of the Night Poems from Daughter to Mother :: Mother to Son from en theos press, the poetry collection we were celebrating, below. By the way, this is NOT a collection of poetry about wine…but poetry by someone who LOVES wine!